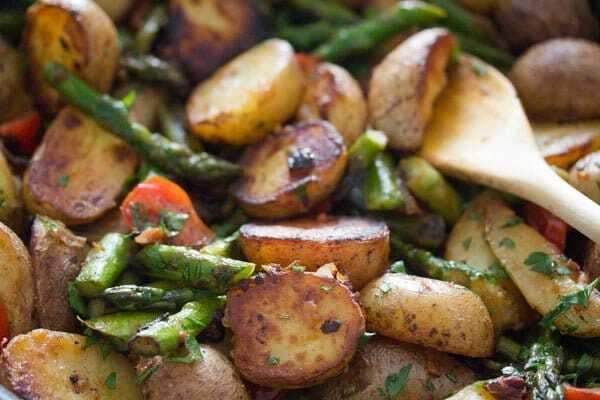 Pan fried asparagus and potatoes, a simple yet delightful spring dish using green asparagus. 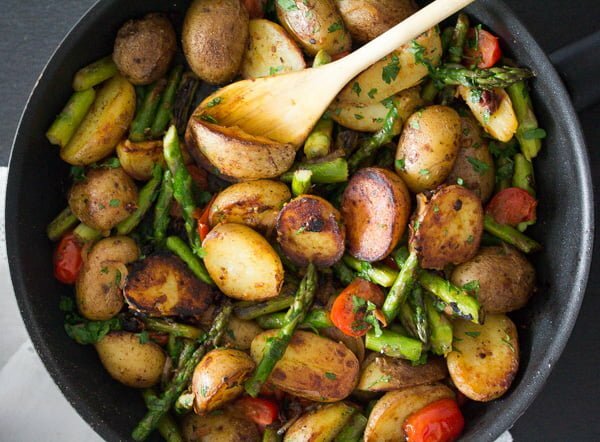 A one pan meal of roasted asparagus and potatoes with sun-dried tomatoes in oil and cherry tomatoes, a really simple dish packed with flavor. Asparagus time is just beginning here in Germany and I have already bought and cooked the first asparagus I saw this spring. The season is so short and I want to make the most of it. I know that nowadays you can buy green asparagus more or less at any time of the year, still I don’t do it much. Not necessarily due to some moral issues (I mean, I buy bananas every week of the year and they need a long time and energy to get to Germany), but mostly because I enjoy eating seasonal produce at the right time. Asparagus, rhubarb, wild garlic, strawberries are all things that grow in Germany and are at their best in the spring. Watery strawberries in February or asparagus in October are not that attractive to me. Just like I am not really keen on pumpkin dishes in Mai. Rhubarb and wild garlic are not even available (unless frozen by me) other than in spring, so I really enjoy cooking and baking using these products at this time of the year. I don’t even know how I came to cook this recipe for pan fried asparagus and potatoes for the first time. I had some fresh green asparagus in the fridge, not enough to make a whole meal with it, but enough if I was to mix it with something else. As my children are not really interested in asparagus, I knew that I had to combine it with something they love, in this case potatoes. This way, I had a whole meal in one pan, a quick and delicious lunch of pan fried asparagus and potatoes with some tomatoes and garlic added, just to make it more interesting. We all loved it! Ever since making it for the first time, I have cooked this dish at least once every season. 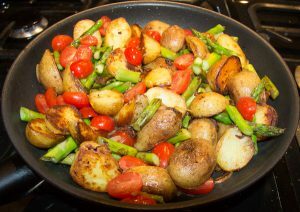 The sun-dried tomatoes are a later addition to the dish, I put them in after reading a similar recipe for pan roasted asparagus and potatoes in a cookbook. 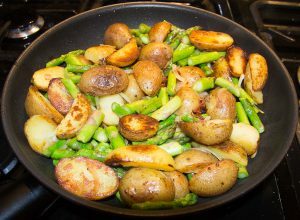 And they work perfectly, adding a little bit of tanginess and more luxury to this asparagus and potatoes recipe. There are two ways of trimming asparagus. You can break the woody end of the asparagus by bending it until it breaks. 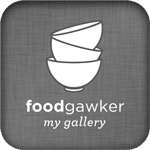 It normally works well and it is the method I use most of the times, but unless you know where to snap, you might end up with a little too much waste. Especially, if you are dealing with asparagus for the first time. A method which can mean less waste is to line up the asparagus stalks, about 5 or 6 at a time and cut where the stalks start to appear tougher than the rest of the stalk and where the deep green color of the stalks starts to become paler, fading to white. I used very small waxy potatoes. You can use new potatoes as well. 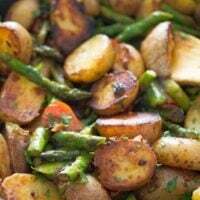 If your potatoes are larger, but you still want to cook this pan roasted asparagus dish, cook the potatoes longer (until tender) and cut them into thick slices before pan frying them. 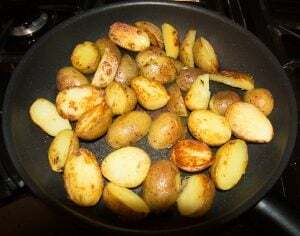 Scrub the potatoes well, give them to a pan, cover with plenty of water, add about ½ tablespoon salt. Bring to a boil, turn the heat down and cook the potatoes until tender, depending on the size of the potatoes this will take between 10 and 20 minutes, probably somewhere in the middle. If using larger potatoes, adjust the cooking time accordingly. Drain the potatoes and let them cool in the colander for about 5-10 minutes or until cool enough to handle. Halve or quarter the potatoes, depending on size. You can keep the peel on or remove it. If the potatoes are larger, slice them thickly. Wash the asparagus stalks and trim them as described above. Cut the asparagus stalks into pieces about 4 – 5 cm/ 1.6 – 2 inches long. Set aside. You can use the leftover stalks to make asparagus broth and soup. into small pieces. Give them to the bowl with the asparagus together with a finely sliced onion. Halve the cherry tomatoes and grate the garlic cloves but keep them separated from the rest of the ingredients. (about 30 cm/ 12 inch diameter). Give the potatoes to the pan and cook on medium heat, stirring often, until golden on all sides. This should take about 5 minutes. Add the asparagus, onion and sun-dried tomatoes to the pan. Stir well, but carefully you don’t want to break the potatoes. Cook for 5-6 minutes, stirring often, until the asparagus becomes slightly tender. Add the halved cherry tomatoes and the grated garlic, some salt and pepper, stir well but carefully again. Cook for another 3-4 minutes, until the tomatoes have collapsed and the asparagus is tender while still retaining a bite. Fold in the parsley and one tablespoon olive oil and adjust the taste with salt and freshly ground black pepper. 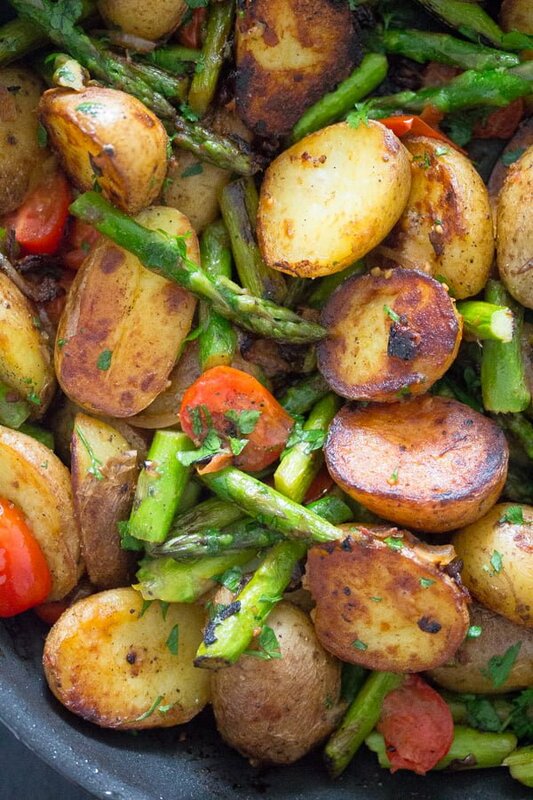 Serve the pan fried asparagus and potatoes immediately with a green salad on the side. Scrub the potatoes, you don't have to peel them. Give them to a pot, cover with water and add some salt. Bring to a boil, lower the heat and cook the potatoes, covered, for about 10 – 15 minutes or until tender. The cooking time depends on the size of the potatoes. Drain well and leave in the colander for about 5 minutes or until cool enough to handle. You can peel the potatoes or leave the skin on. Cut the potatoes into halves or quarters, depending on their size. If you use larger potatoes, slice them thickly. Trim the asparagus as described above. You can either snap the woody ends or cut them with a knife. Cut the stalks into pieces about 4 - 5 cm/ 1.6 - 2 inches long. Give them to a bowl. Halve the onion and slice the halves thinly. Chop the sun-dried tomatoes into small pieces. Give them both to the bowl containing the asparagus. Set aside. Heat the oil in a large non-stick pan or a cast iron skillet. Pan fry the potatoes on medium heat for about 5 minutes or until golden on all sides. Stir often, but carefully, you should not break the potatoes. Give the asparagus, onion and sun-dried tomatoes to the pan. Stir well and continue cooking for about 5-6 minutes, stirring often, until the asparagus becomes slightly tender. Add the halved cherry tomatoes and the grated garlic, some salt and pepper, stir well. Cook for another 3-4 minutes, until the tomatoes have collapsed and the asparagus is tender while still retaining a bite. Fold in the parsley and the last tablespoon olive oil and adjust the taste generously with salt and black pepper. 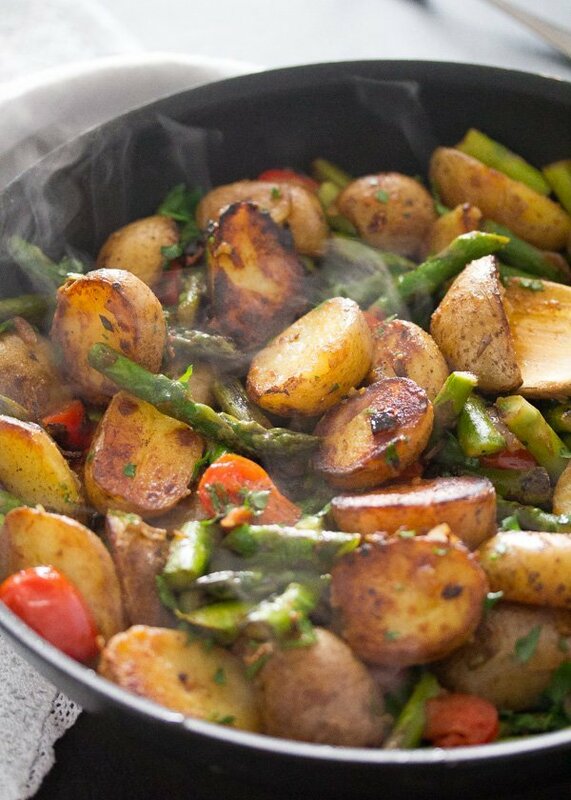 Serve the pan fried asparagus and potatoes immediately as suggested above. This looks like a perfect spring dish! 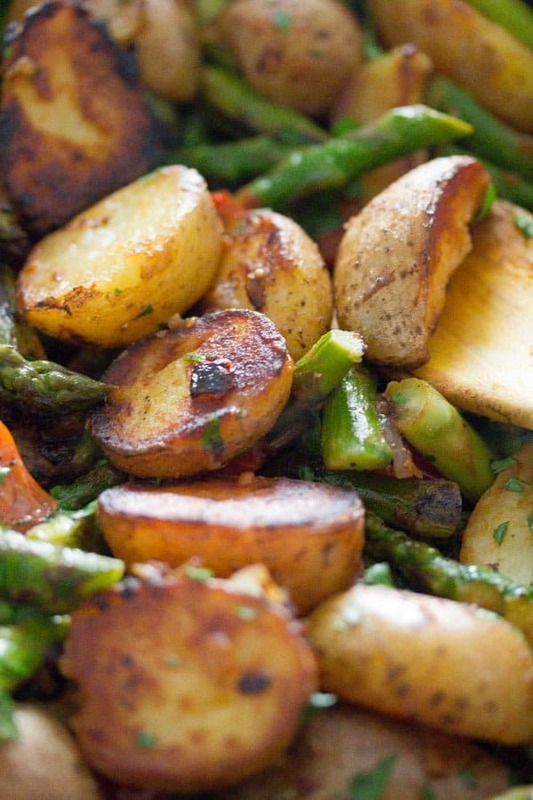 Adina, this asparagus and potatoes looks so flavorful and delicious! Cooking seasonal produce is the best way to celebrate the season! Beautiful! I love the simplicity of this dish. When we were in Germany, I ate white asparagus every day, sometimes with ham and white sauce. Oh my god it was always so good. And a lot of trout! What a beautiful country. White asparagus is more popular than green asparagus in Germany, unlike the rest of the world, I suppose. I love white asparagus with sauce hollandaise and ham as well, I even posted the recipe if you are interested. This looks so good!! I love the idea of pan frying all the veggies. I could have just this as a light meal. And when I want to bulk it up, adding some cooked chicken turns it into a main course. It’s great seeing such a creative dish with my favorite spring vegetable. Just picked up some asparagus and small potatoes today. Can’t wait to make this. Thanks Adina! I make a similar dish with green beans and potatoes and now I can’t wait to try your recipe. perfect spring dish :)Love anything with potatoes. I’ve also already cooked some asparagus dishes! I couldn’t resist the first green asparagus either and I’m glad to learn a new delicious-looking asparagus dish of course!